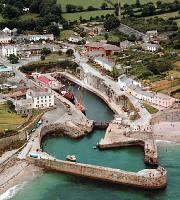 The centre is set on the edge of an unspoilt 18th century, Cornish working seaport, which is also the home of a fleet of square-rigged sailing ships and location for many films. Discover for yourselves what life was like in a Geogian Village and seaport, tracing the history of Charlestown, the oldest Cornish port built for commercial use. Followed by the opportunity to pass through a reconstruction of Charlestown Road with its life-size tableaux's showing various trades and an exhibition of gas appliances past, from the British Gas Museum. The Centre, originally part of a huge complex of buildings used for the handling of china-clay, is built over a network of underground passages and tunnels. Men pushed wagons loaded with dried bulk clay through the tunnels to the ships in the dock below. Some of the tunnels are open for you to explore. Here is 'Prospectors Corner' a large collection of Geological Specimens and early mining equipment. The Centre tells the history of diving, salvage and shipwrecks from the earliest times to the present day, with historic diving equipment, including a replica of the 1740, John Lethbridge's wooden diving barrel, observation chambers and one atmosphere armoured diving suits. The Centre is full of hundreds of relics and artefacts from sunken ships, including cannon-balls, modern shells, guns as early as 1450, personal items and treasure. There are many aspects of history to discover from Roman and Tudor through to Victorian times, much of which falls within the National Curriculum. Our school and teachers packs reflect these areas. This new collection of Nelson memorabilia is a fascinating insight into the man and his predominantly victorious career. A range of artifacts include many medals, 1805 Times Newspaper with interesting information regarding dispatches delivered to the Admiralty on Nov 1805. Also, a letter by Nelson dated 1804, before Trafalgar and much more not to be missed. This impressive collection has recently been added, includes artifacts and lost equipment from the British fleet of 1707. commanded by Admiral Sir Cloudesley Shovell, including his own ship, H.M.S Association. This extremely rare collection containing exhibits nearly 300 years old from the sea bed. Visit the Titanic exhibits and also the other great liners owned by the White Star Company. Signposted off the A390 from St. Austell. Very close to the Eden Project.